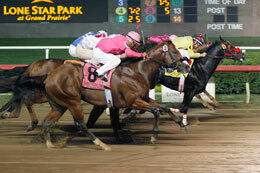 Joker On Jack winning the Grade 1 Refrigerator Handicap on Saturday at Lone Star Park. GRAND PRAIRIE, TX�SEPTEMBER 28, 2013�What a game win by Joker On Jack in the 17th running of the $75,000 Refrigerator Handicap (G1) tonight at Lone Star Park. As a matter of fact, it was quite a game effort by the top four finishers with just a head, nose, head and head separating them at the wire. With Raul Gutierrez in the irons, Joker On Jack who is owned by Wade and Jarrett Helton and trained by Alfrdeo Gomez, was just up at the wire clocking in at 21.310 over a muddy track. The effort earned a speed index of 98. With the winner�s share of $45,750, Joker On Jack increased his career earnings to $314,678 and race record to 13-5-2-3. The three-year-old gelding by PYC PAINT YOUR WAGON out of Miss Six Fortune, by Six Fortunes, paid $9.60, $5.20 and $3.80. Corner K Quarter Horses, LLC is the breeder. Second place went to Jess Fly With Me, returning $8.00 and $4.40. Erika Huitron saddled the colt for owner Antonio Carrizales. John and Sylvia Cain bred the bay colt in Arkansas. He earned $12,750 for the effort. Charal Kid paid $2.80 for show. The winner of last year's Refrigerator Stakes is owned-and-bred by Malinche Cattle Co, Inc. and trained by Erika Huitron. Manuel Gutierrez rode gelding. He picked up $7,500 for the effort to push his career record past $511,000. Feature Mr Bojangles completed the Superfecta. Lota Pyc, Loves Brown Sugar and Bar Struck completed the order of finish. A Toss Up was a late scratch.